Live From the Archives: "Remnants of The Last Man's Club"
"Remnants of The Last Man's Club"
Buckets of rain poured down on the three of us as we clamored towards the awning of the History Center's front door. The familiar "ding, ding" as we entered signaled to Scott Saftler, our fellow board member of the historical society, that we had finally arrived; "I set it there on the back table," he beckoned as we entered the front door, "You'll love it!" Mary-Ellen Jones, Andrea Blachman and I gazed towards the table and saw the forlorn box: Inside it held the only remaining contents of The Last Man's Club of Contra Costa County. We took off our wet rain gear, set down our umbrellas, pulled out our pencils, notepads, electronic gear, and all the while mused about the idea of three women investigating the remains of The Last Man's Club. Eagerly, we took off the lid of the box and inside lay two bottles of Pol Roger Champagne from Epernay, France. One bottle, vintage 1976, was uncorked and empty. The other, vintage 1921, was unopened and entombed in a small mahogany case. Also in the box were various folders, pamphlets and a faux leather binder with the embossed insignia; "Last Man's Club." According to the bylaws -- which were also in the box -- this organization was formed to "promote a close social union and a bond of friendship" among its 32 members all of whom were veterans of WWI. Like most WWI Last Man's Clubs, these Contra Costa County men met once a year on "Armistice Day" to commemorate the end of their war. In 1954, after WWII and Korea, "Armistice Day" was changed to "Veterans Day." At this annual banquet, the 32 men -- and each year the number dwindled -- toast their "comrades" in arms. 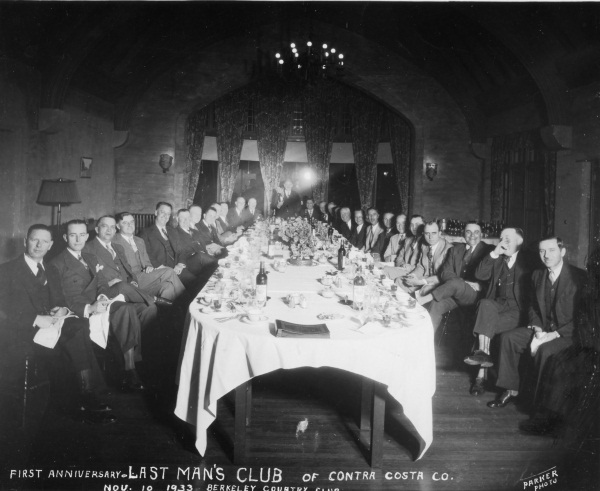 The Contra Costa County Club met for 56 consecutive years from 1932 to 1988. In some clubs, black fabric or a U.S. flag is placed over the empty seat of departed members and sometimes candles are lit in his memory. The bottle of 1921 Pol Roger, with the original signatures of all 32 members written on the label, was also brought and displayed: Imagine the final "banquet" when the last man uncorks the bottle and toasts his 31 departed comrades. Mr. Al Furrer, who was an Army Private at Chateau-Thierry in France during WWI, became Contra Costa's "Last Man" in 1988 at the age of 96. Mr. Furrer was not the only one who humorously questioned the luster of the long awaited "award." Placed inside the faux leather binder were the official Minutes -- often scrawled on the wine lists, placemats or the menus of the establishments where they held their banquets. This was great fun to peruse with Ms. Blachman and Ms. Jones, since they are long time locals who remember the history and the whereabouts of each restaurant. Besides the local country clubs, these men often dined and wined at Dino's on North Main in Pleasant Hill, The Newell House in Walnut Creek, The Concord Inn, Toot's Restaurant in Crockett, San Pablo Rancho, The Sea Wolfe Cafe at Jack London Square and frequently -- particularly while they were still young -- at Goman's Gay Nineties in San Francisco. By the way, these early minutes equivocally state that no "wives" nor "sweethearts" were allowed to attend. As the men got older -- and fewer -- the vivacity and the inertia of the gatherings began to wane. It was sad to read in the Minutes how some men suggested disbanding the club because of illness; it was too hard to get to the banquets and they just couldn't party like they did in the past. In fact, Mr. Furrer told the Contra Costa Independent in 1972; "Lively meetings of the old days are no more." There were only 10 active members at that time but instead of disbanding, the remaining men decided to allow their wives to attend future banquets as "guests." The 1972 Independent had a headline about the Women's Liberation Movement cutting into the Last Man's Club, but I think we know better what was happening to these ailing men who were intent on physically getting to those banquets: they needed their wives to help to keep this tradition alive. And why was this tradition of the Contra Costa County Last Man's Club founded in 1932 and not in say, 1928 -- ten years after the Armistice? What was happening in 1932 that would compel a group of WWI veterans to go out and party together? We like round numbers and it was getting close to 15 years after the Armistice. But, perhaps more importantly, it was also a new era: We could publically-- without recriminations -- drink again! Franklin Delano Roosevelt, a "wet" candidate who advocated the repeal of Prohibition, was elected in 1932 and Prohibition, by this time, was clearly on its way out. Indeed, one of FDR's first accomplishments was to support -- via the radio -- the legalization of 3.2 percent beer. This took place immediately after his inauguration in March 1933, the same year as The Contra Costa County Last Man's Club photographed their first year's anniversary: How many bottles of booze do you see on that table? Also, two other events happened in 1932 that honed, for contemporaries, a powerful, heartfelt image of WWI veterans. 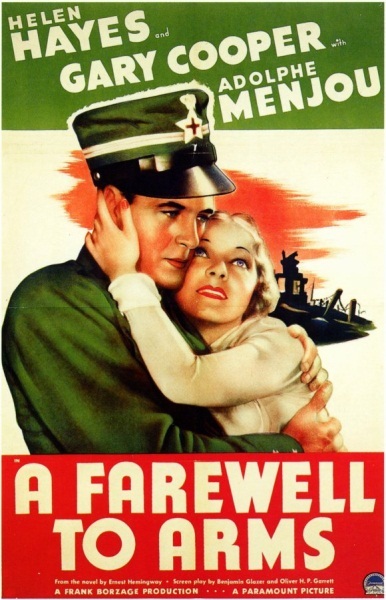 The film "A Farewell to Arms" burnished the image of U.S. soldiers as faithful saviors of Western democracy. This film, like Hemingway's original novel, allows us into the life of a brave, yet homesick U.S. ambulance driver (Gary Cooper). Stationed in Italy, he falls hopelessly and passionately in love with a British nurse while they both try to save lives far away from home. Debuted just 15 years after the war, this film won the hearts of the American audience; it was nominated for more than one Academy Award and won "Best Cinematography and Best Sound." This film, in tandem with the Bonus Army fiasco during the summer of 1932 sealed an admiration and a compassion for WWI veterans. Many of us are familiar with the WWI veterans who marched into Washington D.C. in hopes of receiving their veterans benefits early because of the onset of the Great Depression. Herbert Hoover, the U.S. President at the time, didn't want to give the "bonuses" early because he thought it would fold the country further into debt; Congress agreed. The U.S. Army arrived on the Mall and drove out 15,000 Veterans -- along with their wives and children -- with armored tanks, bayonets, arsenic gas and flames. Poster for movie "A Farewell to Arms"
Given all of this, it's no wonder that Last Man's Clubs throughout the United States, not just in Contra Costa County, sprung up in 1932. WWI veterans were in the hearts and the minds of fellow Americans. It was the Great Depression after all, and people of all sorts were drawn towards camaraderie. Fellow veterans must have been moved by what they saw on film and what they read in the newspapers; it was this drama that must have compelled them to reach out and touch base with their wartime comrades in the form of fraternal clubs. Pressed by our present day commitments, my 21st century comrades and I closed up the box and placed it back up in the Stacks. As we prepared to reenter the winter rain, we wondered out loud whether Veterans today are forming Last Man's Clubs. Or, are fraternal clubs like these just another bygone tradition firmly rooted in our more simple, less fast-paced past? With electronic car keys firmly pressed into our hands, we waved goodbye and went our separate ways. Maybe that's what Mr. Furrer meant after all by calling himself a "lucky guy."